Rocks... in a dress? With arms. Yeah, pretty sure this is a woman in yellow sitting on a pile of rocks, one leg out straight (that's her foot) and the other bent. Came here (albeit several days late) to say the same thing. Unless someone is already familiar with Mailchimp's offerings, how is their new lander going to make it clear to them what they offer, and how they are better than the competition..? The colors and typeface remind me of Curious George! It works well, I really like it. I like it. Just not on Mailchimp. Stole the words right out of my mind. I like the bird animation thing on the main page. I'm not a huge fan of this trend but this implementation of it is not cringe inducing (except for that stone dress guy someone posted—that's just frightening). And Mailchimp just lost its unique personality. they're foregrounding Freddie more than ever and have an incredibly unique wordmark, plus illustrations that don't follow the trend at all. so how do you figure that? Is this sarcasm or are you trolling on purpose? I'm not sure why you think this is trolling. What a weird response. Is anything I said not true? And how have they lost their unique personality if they still look unlike anyone else in the space? They have changed one unique personality for another. Thanks for the downvotes instead of discussion though! Then you seem to be a bit out of touch with the industry. Collins did this redesign. Which, looks like all of their other redesigns for the companies they do; the color palettes and illustrations are exactly the same styles and some even take the same illustrations and are repurposed - https://www.wearecollins.com/ - there is nothing unique about this. They've moved Freddie, their monkey, into the background and no longer lead with it throughout the app. Sign in and use the actual app. Freddie is no longer their brand character despite using him as their logo. It's now these child-like illustrations that are becoming a disease in our industry. And, if you haven't, go ahead and read through the comments on this thread. Others agree with my sentiments. I'm aware of Collins. This clearly isn't a discussion about work, it's a need to be right, so.. you're right! So much for that thoughtful discussion, you were ranting about above. I dont see how they're 'foregrounding Freddie more than ever' when he used to be a large colour image on their homepage. I think this rebrand would work better if it didnt have that super cheap yellow as a primary colour. Mailchimp managed to avoid the spam association by having shithot branding, and now it looks cheap, so to me it just looks like a spam factory now. He is now officially the logo, which they always struggled with doing before as they weren't really intended to be together and were of differing styles. I didn't look at all applications and am not a user so I may be incorrect on a holistic level - my opinions are just about the branding and marketing site. Hmm, I always associated that monkey with mailchimp. I don't think it necessarily needs to be in the logo. Also I have no idea why people are downvoting you. You're giving perfectly valid points. This site is silly. Meh, it was an eventuality of introducing downvoting in a design group - strong opinions combined with the fact that downvotes are always used as "disagree" buttons! Anyway, I agree the association was strong before. I don't think they needed to put Freddie in the logo but I think this just more strongly associates the already strongest association with the brand. Which to me would be doubling down on what sets them apart. Freddie Got Foregrounded. Fall 2018. "illustrations that don't follow the trend at all"
Aren't they directly following the scratchy illustration/collage trend started by Medium, Dropbox, Intercom, etc, several years ago? I'm not saying they haven't ever been done before, but they're certainly not the common watercolory illustrations that are common in the industry. Medium's and Dropbox's are quite different in structure and material, though perhaps you're referring to an earlier brand for either of them? These are all on Dropbox's current site. Yeah - to me the defining point of this style and mediums is the mixed-media collage aspect. certainly a similar line quality though! Not ~exactly~ the same, sure, but definitely on the heels of Medium, Dropbox, etc's revival of 1960s and 70s sketchpad illustration style. these illustrations are batshit insane and i guess that's good. I feel like eating some Cheerios right now. I wonder if it's because they offer more than just email newsletters they want to de-emphasise that as their main focus. Not really sure what the homepage focus now is though to be honest. What was the reference before? Yeah same. Mailchimp as a brand already had a really nice personality. While this looks nice, it doesn't look like mailchimp at all. Seems like a weird direction. Mailchimp went from being a design leader to just another brand. Not going to question the rebranding, as I'm not aware of the goals that they're trying to achieve. But the usability of the product as always been strange and I just question the priorities. Why the brand instead of improving the usability of the product? I agree, as a long-time user of MailChimp it annoys me that they spend so much energy on branding and marketing while their core product improves at such a slow pace, if at all. Looks a bit designed by committee to me. I appreciate the bold step with the yellow and the child-like illustrations, but I'm not sure they've found a unique voice with this one as opposed to crushing any semblance of a brand they had. New illustrations look a little too similar to Airtable. They have lost all original personality that their original brand / site had. Really disappointing that everyone seems to be following this child-like illustration style as well. You know someone dropped the ball when they forgot to hang the punctuation. Hm...is it me or does the Cooper + Graphik pairing feel off? I went into our Mailchimp UI and it said it has a new interface. What I saw was the old interface with some marketing illustrations slapped on. Hmz. Boring, unoriginal centered design / content that looks like a million other sites = check. Forgettable. Mailchimp is presumably still in the business of offering an email marketing and automation platform. Though, my business spidey senses tell me they are rebranding and attempting to reposition as the email marketing automation space gets more crowded and consumer behavior further shifts away from email. That’s ok, but the brand, product, positioning and messaging seem extremely confused and requires deep investigation to get the point. Are they trying to encroach on Intercom’s turf, Hubspot’s? Are they seeing competition from players like ConvertKit and attempting to differentiate? It all seems confused and like a mid-life crisis. They should clearly state their objectives on the homepage. If one were a cold visitor to this homepage, upon encountering the overwhelming brand and visual language, and the extremely vague and general messaging - it would be very difficult to grasp who they are and what they do. In fact, in this case - the brand, i.e., visual identity just get in the way and impose too many cognitive demands on the visitor. The Mad, Spy vs. Spy illustrations are technically and visually interesting, but they do little in the way of fostering further understanding of who they are and what they do in the presence of the overwhelming message vagary that is breaking out everywhere. The technical attributes of the brand and visual identity are polished and professional. The aggressive yellow color story in contrast with Cooper is nice. The graphical purity of Freddy refreshed is well done. Even the primary CTA with the paradise deep green works. Personally, I’m not a fan of the logo typeface. It feels more appropriate for a child’s toy than a business tool and sets an unpleasant visual argument with Freddy. Especially the bowl of the “a” - which is illegible. Further exacerbating the illegibility of the logo typeface is the tight kerning. All the best to Mailchimp, I’ve always been a big fan. It’s just really unclear to me who you are and what you are trying to do as a business. Finally, if the target audience is small businesses - I fail to see how this will connect with that audience. No, no, no....This rebrand feels OLD. This illustration style was popular 10+ years ago. This font is so old and archaic its almost as if they are trying to make ancient fonts popular again. Doesn't feel inspiring or fresh. They lost their personality. They should have used their mascot and brand character to at least be the artist creating all these illustrations or have various artists interpreting the mailchimp in different styles. Seems like this was created by a team that doesn't understand branding and created art instead of solved a branding issue. I like the 70's editorial style. Feels like Andy Warhol drawings and NewYorker magazine. Does anyone know who the illustrator(s) are? I don't think that it looks bad, but I'm not so sure about that yellow homepage. I wasn't aware of the brand refresh until I opened it and it just seemed very strange. 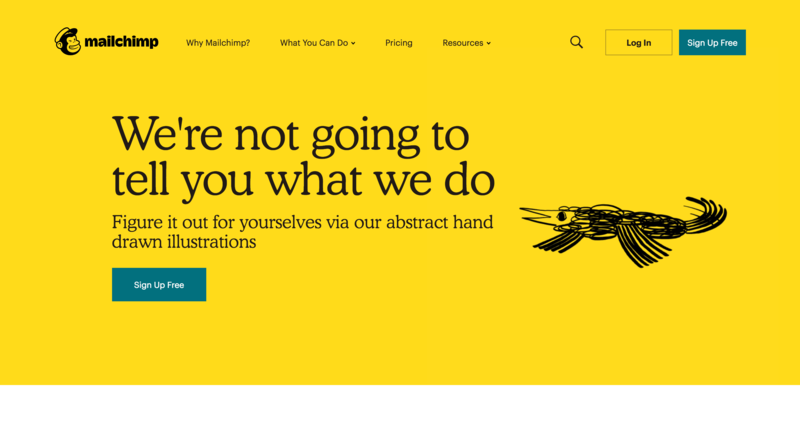 It's beautiful, but I bet the strong yellow in the homepage would cause a massive drop in conversion. The contrast between the yellow and the blue button is not strong, so it makes the main CTA weaker. Also, yellow is often associated to a warning sign, so as a main color it could turn some users off.